Bounce with the modern sounds of House in this magnetic pack of samples and NI Massive patches from TD_Audio. Future House captures the progressive energy of modern house with deep, round Bass, charged Leads and driving Drum Loops. Tight and clean, this smoldering set is stocked with Drops, Chord Stabs, smooth Vocal Loops, and edgy FX, Noise and Mechanical Sounds. This progressive micro pack is perfect for producers looking to explore new sounds at the forefront of House. It contains everything you need to hit hard on the dance floor: more than 100 crystal-clear Wav Samples, 10 NI Massive Presets, and an NI Battery 4 Kit to bring the oneshot sounds to life. Rock out a track or spice up a remix, and tweak these sounds to your personal style. 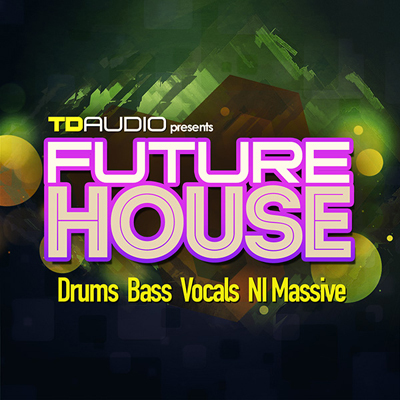 Future House is presented by TD_Audio, the powerhouse team of Twisted Reaction (Function Loops Label Group) and Lenny Dee (Industrial Strength), two tenacious names in modern sound design. Combining cutting-edge gear with meticulous engineering and production, TD_Audio creates upfront production packs and kits at the frontline of dance music. Peer inside this crystal ball of a pack and push house music into the future—the sounds of tomorrow are here.